Posted May 08, 2018 by Eds. In the fourth episode of K is for Karl, Paul Mason travels to Manchester, the birthplace of the Industrial Revolution. Here, Mason shows us how the use of human labour and the development of machinery brought about contemporary capitalism. Capitalism, Marx said, is based on the theft of what he called alienated labour time. 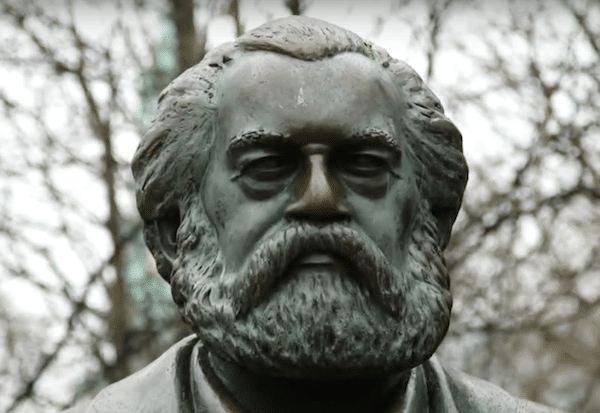 K is for Karl – A Series of 5 Films by Paul Mason on the meaning of Marx today. Why does Marx matter today? Is the question posed by British journalist and filmmaker Paul Mason in five short films produced by the Rosa Luxemburg Stiftung to commemorate Karl Marx’s 200th birthday. Through Marx, Mason explores the topics of “Alienation”, “Communism”, “Revolution”, “Exploitation” and “The Future of Machines” in order to demonstrate how Marx, who Mason describes as the most influential thinker of the modern world, remains deeply relevant to understanding our contemporary world.